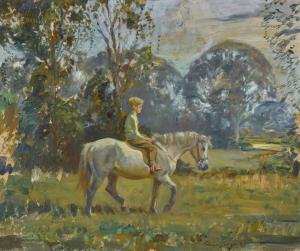 Find artworks, auction results, sale prices and pictures of Edward Brian Seago at auctions worldwide. Edward Seago RWS (1910-1974) - The Flooded Fen, Norfolk, oil on board, gallery label verso for P&D Colnaghi & Co Ltd, 14 Old Bond Street, London, 40.5 x 61cm. Under glass. Paint good and stable. Very small amount of craquelure at 3 o\’ clock. No breaking out. Appears completely untouched. Probably original frame. Edward Seago, RWS, RBA (British, 1910-1974) The Capricorn at anchor, Honfleur signed 'Edward Seago' (lower left) oil on board 45.7 x 61.4cm (18 x 24 3/16in). Footnotes Provenance Property from the estate of the late James Ivory. Seago acquired his first boat Endeavour, primarily to function as a floating studio and provide the means to travel abroad. After many years of service and an unreliable engine, Seago purchased a replacement, Capricorn, depicted in the present lot. 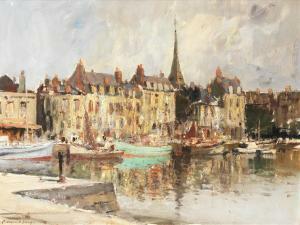 Seago sailed to Dieppe, Le Havre, Paris and on the way home via Honfleur harbour, producing a large number of works. He returned many times to the continent, finally selling Capricorn in 1968. 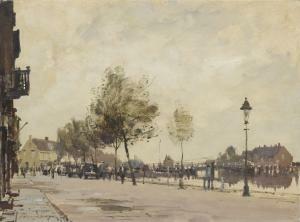 PROPERTY FROM A NEW ORLEANS COLLECTION Edward Seago, R.W.S. BRITISH A BUSY STREET IN PURMEREND, NORTH HOLLAND Edward Seago, R.W.S. signed Edward Seago (lower left) oil on canvas 18 by 24 in. 45.7 by 61 cm Provenance Provenance Frost & Reed, London Sale: Sotheby Parke Bernet, Los Angeles, June 23-24, 1980, lot 210, illustrated Acquired at the above sale Catalogue Note According to an inscription by an unknown hand on the stretcher,the present work is set in Purmerend in the northern Netherlands. Edward Seago, R.W.S., R.B.A. 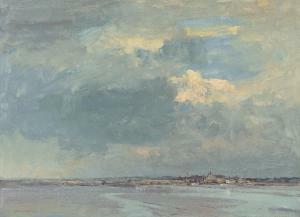 (1910-1974) Low water, Manningtree - Essex signed 'Edward Seago' (lower left) and with inscription 'LOW WATER, MANNINGTREE - ESSEX' (on the reverse) oil on board 26 x 36 in. 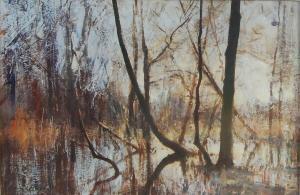 (66 x 91.4 cm.) Provenance with The Everard Read Gallery, Johannesburg, South Africa. Private collection, South Africa. Private Collection, UK.